Life Debt, the second book in Chuck Wendig’s Star Wars sequel/prequel trilogy reintroduces some much loved characters from the Star Wars Universe. The Aftermath series is set not long after the events of Return of the Jedi but Wendig liberally sprinkles it with Easter eggs and foreshadowing of The Force Awakens. Being part of the new official Star Wars canon, Wendig also throws in connections to other official books, comics and TV series. 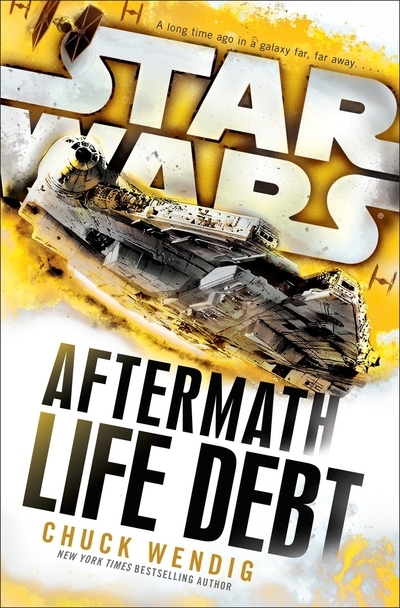 Life Debt, like Aftermath (reviewed here) before it, focusses on Norra Wexley, ex Y-Wing pilot. Norra and her bunch of misfits go round the galaxy capturing former imperial officers so they can stand trial. The team, includes an ex-imperial officer, a bounty hunter, a soldier and Norra’s son Temmin “Snap” Wexley (who, as Star Wars aficionados know, grows up to be Poe Dameron’s wingman in The Force Awakens). The group formed in the previous book but were not particularly memorable and so it takes a while to reacquaint with them. To do this, Wendig throws in an opening action sequence that serves to highlight the strengths of this series. While the characters grow through this book, they still feel like “types” when the final credits roll. The plot itself is pure fan service, using familiar characters to gloss over the fact that the main cast are not all that interesting. Princess Leia, struggling to help build a New Republic, asks Norra and her crew to track down husband Han Solo last seen trying to help his best buddy Chewbacca liberate the Wookie home planet of Kashyyyk. Turns out the Empire turned Chewie’s people into slaves and one of its many remaining fragments is keeping a tight grip on the population. At the same time, a new dark force is rising in the remnants of the Empire, one that is intent on bringing the New Republic down. Life Debt is laden with references, characters and locations from across the official Star Wars canon. As with the previous volume, Wendig achieves this partly through cameos in the main plot and partly through short interlude chapters that have no real connection to the story but illuminate other corners of the Star Wars universe. This allows him to visit Force Awakens characters like Maz Kanata, the father of the evil General Hux and have walk on roles from characters like Admiral Akbar, Mon Mothma and Wedge Antilles. As before, a fiar amount of knowledge is assumed so that knowing what a bantha is or why Jakku might be important or what a Sullustan or Trandoshan looks like helps immensely. And if that was not enough to seal it, an important plot point turns on the reader knowing something that even this Star Wars fan did not know – Emperor Palpatine’s first name (it’s Sheev for anyone who is really interested). Given all of the above, this is a book for Star Wars fans only. But it does provide some well paced action and other diverting material to tide them over until the next movie.